Let it Ride Poker - talent network, inc.
Let it Ride is a card game that is a variation of Poker. It combines large payoffs for small wagers with the drama of drawing cards to fill the Player’s hands. The difference is that Players aren’t playing against each other or the Dealer. All that the Players have to do to win is to get a qualifying Poker hand (i.e. a pair of 10’s or better). The game begins when you place equal bets in the three betting spots in front of you on the table lay. All of the Players are then dealt three cards (face down). The Dealers also deals himself two cards face down. The Dealer’s two cards are actually “Community Cards” and will be used by all of the Players to make up their five card poker hands. There is also one Joker in the deck – it is used as a WILD card. After Players receive their three cards, and it looks as if they have the beginnings of a winning hand (or if they’re just feeling lucky), they can “Let It Ride,” which leaves all three of their bets. The Dealer then turns over the first Community Card. This becomes the fourth card in all the Player’s hands. If a Player has a winning hand, they will let their remaining bets ride. If they don’t have a winning hand, they can once again take back one of their bets. If a Player has taken back two of their bets and only has one bet left, they must let this last bet ride. The Dealer then turns over the second Community Card, which completes everyone’s hand. If a Player’s final hand is a pair of 10’s or better, they win! 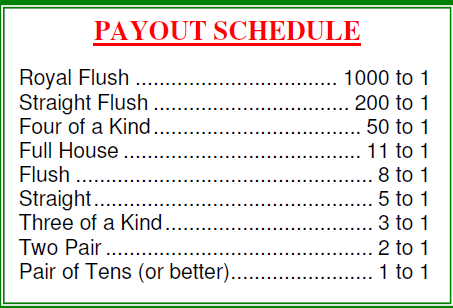 Their winnings are according to the Payout Schedule below. Player’s winnings are doubled if they allowed two of their bets to ride, and tripled if they allowed all three of their bets to ride.